Designer furnished apartment with unique style, comfort and prime location in the center of Pamporovo ski resort, by the hotels Orlovets and Murgavets. 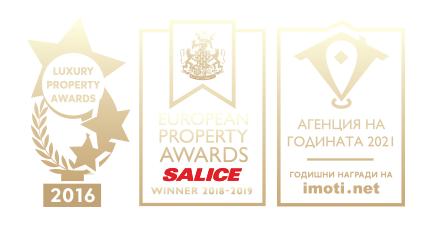 The apartment is set on the third floor in the complex Pamporovo Central VIP Residence, designed and built in the modern Alpine style, of high quality construction materials and according to all European standards and requirements. The apart-hotel is completed with 35 luxury apartments (studios, one-, two- and three-bedroom apartments and 2-level penthouses) with panoramic views and excellent conditions for your holidays in any season of the year. The apartment (total area - 56.44 sq.m., living area - 48.5 sq.m. and common areas - 7.94 sq.m.) consists of a living room with fireplace, a kitchenette, a bedroom, a bathroom with WC, a hallway, a terrace with beautiful views of pine forests. The floors are with tiles and the windows with PVC joinery. The heating is by electric radiators and fireplace. The luxury furniture can be seen in the photos. Apart-hotel Pamporovo Central VIP Residence has two elevators, underground parking lot on four levels with 80 parking spaces, 24-hour security, video surveillance and security system, modern fish restaurant with panoramic indoor and outdoor terrace. The municipality and the police are set in the building, too. Exclusive style and comfort amongst the breathtaking beauty of the Rhodope mountain, in the sunniest mountain resort in Bulgaria with excellent conditions for skiing and active recreation.